i hung some more art. there is a bit of everything here! 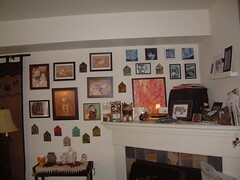 my headed dolls and houses, + watercolors and pen and ink. also prints from: audrey kawasaki, naomi nowak, edward s. curtis, and mike robinson. 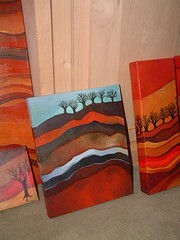 original paintings by anna barrow. when you have a tiny condo, you just have to hang art everywhere! this painting is part of a new series i am working on, based on traditional mehndi designs - although with my own twist, as it were. it is acrylic with ink on canvas. i am working on several others in this series. i am also working on finishing a knitted skirt and a knitted dress! this landscape is acrylic on canvas, with a bit of ink. it is 16x20". i wish i could really do them justice in photos! i am also ready to start another violin.. i just need to start the tedious task of sanding down the existing finish! i have returned! last tuesday morning my friend brent kindly delivered janusz and i to the airport. our flight was scheduled to depart at 9:25, but actually departed at 10:55 due to fog in san francisco. we landed around 1:00 and got on BART, which was very handy. we walked from the powell st. station to our hotel, which was on nob hill. the golden gateway holiday inn. then we walked to china town, over nob hill and and wandered a bit, then off the SFMOMA for the FRIDA KAHLO show which was wonderful! also, the SFMOMA gift shop is the best museum gift shop i have ever been to by far. janusz and i both got a few books and some gifts. he splurged and got a huge book on DADA among other things. i focused more on frida. we both really enjoyed the show a lot. there were quite a few paintings -- more than i expected to see in 1 place, and lots of photographs. i saw a number of paintings i had never seen reproductions of and i had never seen any originals before -- needless to say they are much better than the reproductions. after the show we went back to chinatown and had dinner at The Empress, a really amazing place. the food was quite good, but the ambiance was unbelievable. and given how nice it was, i thought the bill would be about 50% higher than it was. we had wonton soup, almond chicken, and janusz had some sort of pork dish, i forget what. i tasted it but it was a bit too spicy for me! then we walked back to the hotel and went to bed. on wednesday we had breakfast at Mel's drive-in, a 50s style diner, then walked to golden gate park. which was quite the walk and lots up-hill. did see lots of beautiful victorians on the way. at the park we went to the chihuly show at the de young art museum, which was quite nicely done, especially the blanket room. of course it was not really any great surprise to me, since i spent a long time working on that show. then we had a lovely tea in the tea garden, and visited the shakespeare garden. paxton gate.. everything in this shop was so cool.. bones, fossils, taxidermy (okay some sort of creepy too) and all sorts of unusual and unexpected things. (janusz has become smitten with an otter skeleton who is called oberon.) i am sure mandy would have loved it. their website: Paxton Gate. then we went next door to a place i can't even explain, the pirate supply store. their website: 826 Valencia. be sure to read their uses for LARD. needless to say i never would have found those shops on my own, janusz guided me to them. also a voo-doo supply store, which he was quite keen to go to, though he said he was disappointed in the selection. the incense was too strong for me so i retreated. we stumbled upon a wonderful store for lovers of zines and self publishing..Little Otsu. i quite enjoyed that. 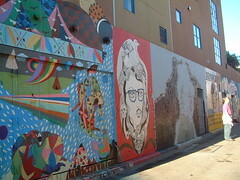 then we found some wonderful alley murals. after that it was off to the fisherman's wharf. which was too touristy for me. we did see the sea lions, though not well since it was dark by then. certainly heard them. janusz had his clam chowder in a sourdough bowl and i, after many adventures, managed to obtain some lobster bisque. also stumbled upon the rip squeak gallery. that made me happy. because i like mice. by then it was about 10 and i was ready to collapse, so we went back to the hotel and went to bed. this morning we got up early, packed, took a cable car ride, and spent the last few hours wandering around chinatown, union square, and yerba buena gardens, had breakfast in a real french cafe, and hopped on BART back to the airport. in 48 hours we walked a bit over 10 miles, i am utterly exhausted! my poor twiggy ankles. i am glad janusz was with me. he had been to SF several times before and turns out to have a good sense of direction. he did an excellent job as companion and navigator. i am sure i would have done much less and been lost and stressed out more had he not gone with me. well, things are evolving as we go. 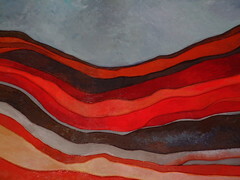 i started this series last summer, and it has changed a little, but i still like the way things flow and hang together. i finished another couple paintings. again i really wish i could capture more of the subtle colors, but i do really like the palette in this one. it's called "six trees." i wish i could really capture the subtle colors in these paintings, but i can't quite. they look a bit more "cartoony" here than in real life. this, though, is what i have been working on. 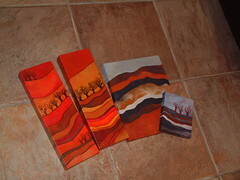 the two on the left are finished. the two on the right are in progress. 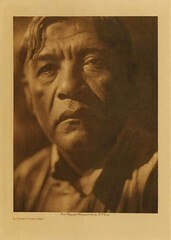 for reference the tiles in the background are 12x12"
this is one of my favorites of the current ones i am going through, folios 12-14, copyright (expired) 1923-1924. i generally do not like the portraits in contemporary clothing as much, but these is something s haunting about this man's expression. there is something that is lost, and if not for photos like these, maybe it would be too easy to forget what was left behind, remembering what was lost. and then it would really be gone completely. this was a birthday gift for my art girlfriend kathy. she lives on vashon island, so it seemed appropriate. the shell is a raku bead from RAMA. 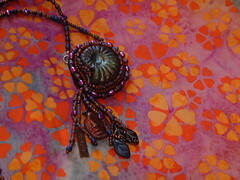 i also used a RAMA face bead in the fringe, along with copper charms. it is beaded on ultrasueude with seed beads and fresh water pearls. my little friend ingrid turns one tomorrow. 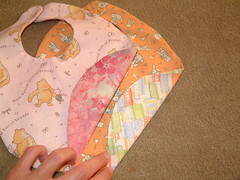 i made her these little bibs using a pattern i found in a japanese craft book. it was fun and easy! the fabric came out of my rather extensive collection. they close with snaps, but you could use velcro also. the violin, it is done! now --at least soon-- on to the next one. 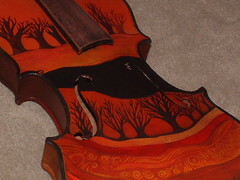 well, once i determine if it is worth saving..
this is a 3/4 sized violin, painted with acrylics and ink. click for more photos on flickr. 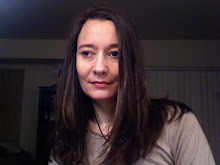 in honor of my sister, who is an island girl, like me, and currently on an island sojourn. 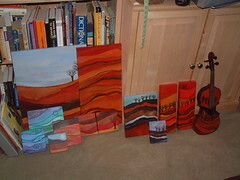 last night i worked on the violin and another canvas, and prepped 2 more. it was good. listened to harry potter audio books while working, though i had to stop earlier than i wanted to because my back hurt. working on the floor may not be ideal, but it's what i have room for! 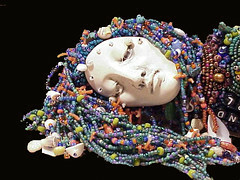 Island Girl is a beaded doll I created a number of years ago, in honor of my Island home -- Vashon Island in Puget Sound, where I grew up. I am actually planning to spend next weekend out there and am excited about it! i am excited because i bought my tickets today to go to San Francisco with my friend janusz. we are going to be there 2 nights. we are going to do to the Chihuly exhibit at the de Young and the Frida exhibit at SFMOMA. and whatever else comes up! 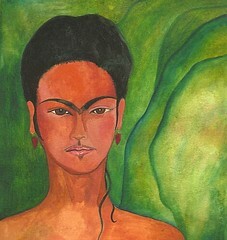 this is a painting i did of frida a few years ago. 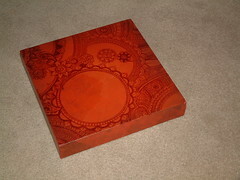 i think it was 8x8" or 10x10" or so. i am not entirely sure. dreaming , in pen and ink. i was sickly all last week, so did not get much art, or much of anything done, other than a little knitting. i am still working on the back of the dress, louisa harding's marie. and i am also working on a pencil skirt pattern from handmaiden yarns using fleece artist hand dyed ottawa. the dress, being lace, is my project for when i can concentrate, and the skirt if my project for when i need to be doing something else at the same time. i did do some art this weekend, that i can't show you.. yet. 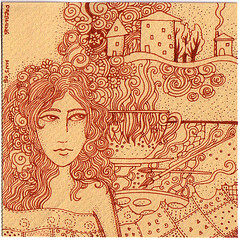 and this.. dreaming is 4x4" and is available in my etsy shop.